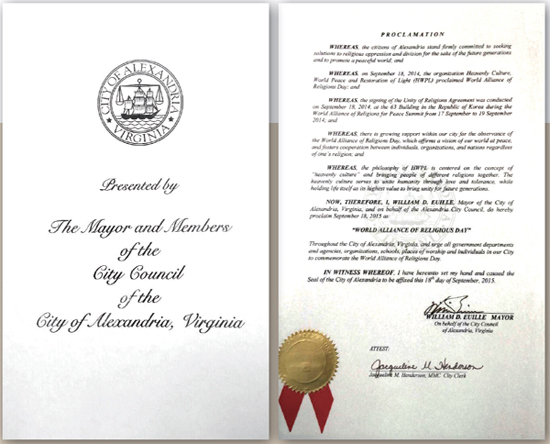 The mayor and members of the city council of the city of Alexandria, Virginia proclaimed September 18th as the ‘World Alliance of Religions Day’ to commemorate the World Alliance of Religions’ Peace (WARP) Summit, an unprecedented international peace festival held by HWPL on September 18th in Seoul, South Korea. The mayor and members of the city council of the city of Alexandria, Virginia has acknowledged HWPL’s dedication in bringing people of different religions together for the establishment of peace and has recently proclaimed September 18th as the ‘World Alliance of Religions Day’ to commemorate the World Alliance of Religions’ Peace (WARP) Summit, an unprecedented international peace festival held by HWPL on September 18th in Seoul, Republic of Korea. In addition to the accomplishments above, the National Assembly of Ecuador has recently conferred an award of national recognition to acknowledge and cooperate with the works of HWPL for the commemoration of May 25th. In the preamble to the award, the government of Ecuador recognizes that HWPL has dedicated, since its foundation, the efforts and energy aimed at actively pursuing missions widely supported by many countries while solving current issues of the world for the purpose of restoring human dignity. While the government also recognizes the works of IWPG and IPYG, the award of national recognition highlighted hard work of Chairman Lee of HWPL in spreading the global peace movement. The National Assembly of Ecuador has expressed its sincere gratitude for Chairman of HWPL, Man Hee Lee’s spirit of volunteerism and his dedication toward preserving and fostering culture of peace.